Versatile singer Asha Bhosle and actress Rekha reunited at the 5th Yash Chopra Memorial Awards on Friday night. It was a heartwarming and emotional moment as Rekha presented the award to Asha Bhosle. Both the divas — dressed in golden saris — lit up the stage with their elegance and poise at the event. Asha Bhosle lent voice to Rekha to create magic in the classic film Umraao Jaan, which is seen as one of the most iconic movies of the actress. 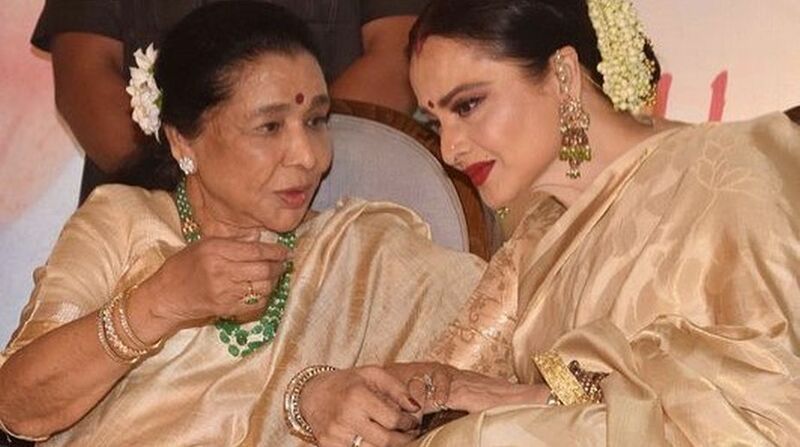 Rekha bowed down and touched Asha Bhosle’s feet and gave a peck on her cheek as she felicitated the singer. This gesture of the actress left the singer teary-eyed on stage. The veteran actress also had some wonderful things to say about Asha Bhosle as she remembered the days when they worked together. “I am here because of two people I love very much — and those are Yashji and Asha tai… What should I talk about Asha Tai? It’s like showing light to the Sun. She is an integral part of me, that’s what I believe, but I didn’t know that when I was a child,” Rekha said. #ashabhosle honoured today by several leading film personalities including actress #rekha at the Yash Chopra memorial award. “I remember, Asha Tai once met me in Raj Kapoor’s party and literally instructed me to perform better in songs of ‘Umrao Jaan’ as she sung all my songs in that film. So, when I was shooting for ‘Dil cheez kya hai’ or ‘In aankhon ki masti’, that time I was only remembering instructions of Asha Tai. So, whatever you have seen of me in that film is all because of her,” Rekha said.